Seeds or plays on table. 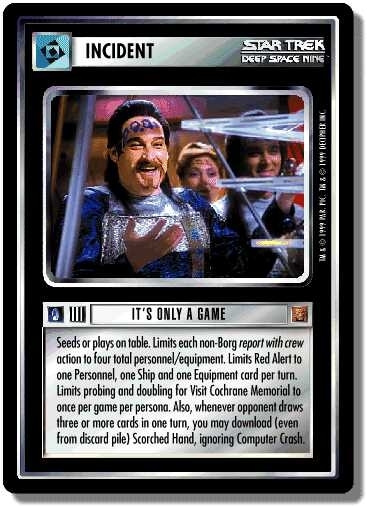 Limits each non-Borg report with crew action to four total personnel/equipment. Limits Red Alert! to one Personnel, one Ship and one Equipment card per turn. Limits probing and doubling for Visit Cochrane Memorial to once per game per persona. Also, whenever opponent draws three or more cards in one turn, you may download (even from discard pile) Scorched Hand, ignoring Computer Crash. There are 26 entries for It's Only A Game (ST1E 8 U 38) at the Tradeplace (58 haves and 4 wants). Click here to see all trade list entries for this Uncommon card!